Just Shutters of Thames Valley bring you the designers’ choice in window dressing. Stunning wooden plantation shutters will add the wow factor to your home, inside and out! Call us today on 0118 907 1543. 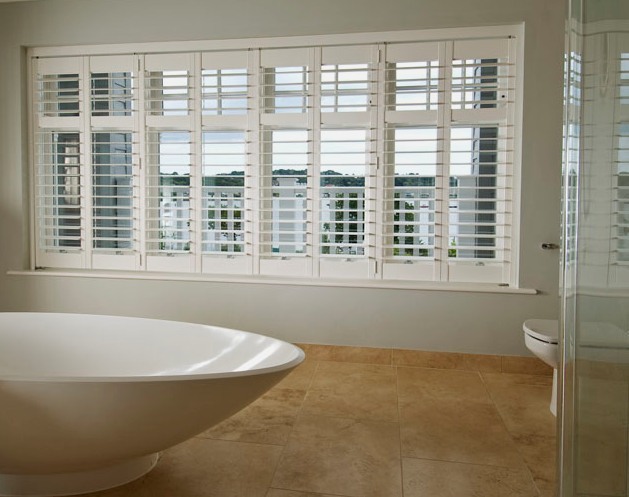 Just Shutters Plantation shutters are made from the highest quality materials. Let light into your home without compromising privacy and keep the heat in on those chilly winter days. Plantation shutters will reduce your heat loss and increase the value of your home, a must have investment! With beautiful styles to choose from, made to fit any size or shape of window, doors or conservatory, your shutters come with a lifetime guarantee and are maintenance free. Your local specialist will ensure your shutters are expertly fitted with the minimum of fuss and disruption. Just Shutters have specialist in-depth knowledge and will consult and advise you on style, colour and configuration. Plantation shutters will be a beautiful addition to your home and with the experience of an established, family run business to advise and provide you with a first class product and service at a competitive price, your investment will bring you pleasure for many years to come. Our reputation for quality and service is second-to-none with the highest percentage of 10/10 reviews on checkatrade than any in our sector! A 9.9 score overall with over 1700 reviews. Contact us today for your Plantation Shutters in the Thames Valley 0118 9071543 or follow the links above and we would be delighted to assist you further. Shutters designed and also fitted in 2 rooms. – Customer of Just Shutters Amersham.